“College is about finding out who you actually are.” Jynx Boyne, a current senior of the Weldon School, has made great strides in learning about their self, their community, and the world. They initially joined BME with the intention of starting a non-profit clinic for amputees. Throughout their experiences here at Purdue University, Jynx has come to identify as gender neutral, and has become an active member of the LGBTQ+ community. After having learned about the lack of healthcare support that this community faces, Jynx has decided to expand their idea to an all-purpose clinic specifically for disenfranchised populations. Through the BME curriculum, student leadership, extracurricular jobs, volunteer experience, study abroad, and undergraduate research, Jynx has exposed themselves to the sociology and the science behind LGBTQ+ healthcare challenges and grown this passion into an aspiration. 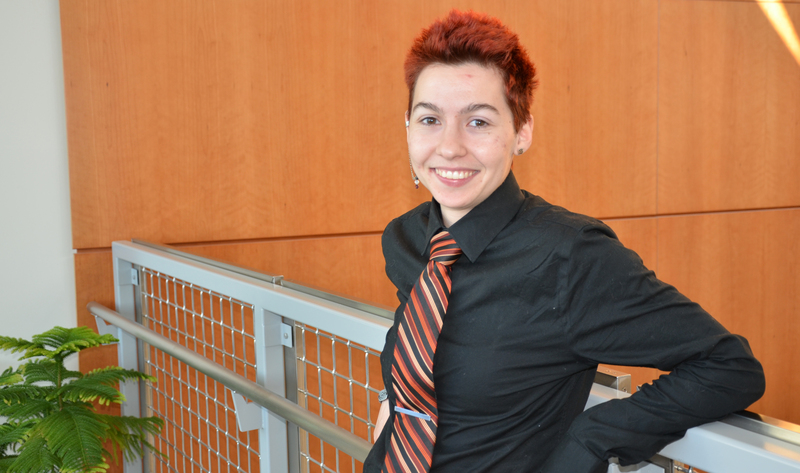 Jynx has served as the President, and currently serves as the Treasurer for NOGLSTP @ Purdue (National Organization of Gay and Lesbian Scientists and Technical Professionals, Inc.), a professional society that educates and advocates for LGBTQ+ students in STEM. Through having successfully engaged in a technical field, Jynx has been able to guide other members as they navigate the challenges involved with being a part of this community. Additionally, Jynx is actively involved in community outreach with the LGBTQ+ Center and the International Center, seeking to help minority populations overcome challenges. Their third year, Jynx went on the Transatlantic History of Sexuality study abroad in New York, Paris, and Amsterdam, seeking to research how healthcare systems either helped or erased the different communities. Speaking with an activist, they learned how people “just don’t see the medical professional side of the AIDS crisis.” In many instances, it was apparent that the government was actively seeking to shut down organizations that were providing HIV clinics to the LGBTQ+ community. Through this study abroad experience, Jynx cultivated an understanding of the deficiency in available healthcare for the LGBTQ+ community. For the past year, Jynx has been researching at the Center for Implantable Devices in the Weldon School in Dr. Pedro Irazoqui’s lab, working to develop a constant pressure chamber to help measure respiration in rodents non-invasively. Those respiration rates will then be used to further the study of the implantable neural prosthesis that are being developed to combat epilepsy. Through actively participating in this research, Jynx is furthering the inclusion of the non-binary gender community into STEM research fields, while simultaneously exposing themselves to new perspectives involved with epilepsy. Jynx epitomizes the altruistic nature of what engineering is all about: improving people’s lives. Through capitalizing on opportunities within the Weldon School and Purdue University, they have served their community and will continue to develop themselves as they seek to develop the health of others.